Well just like the economy, it looks like the idea bottle has run dry for One Wine Per Week. The site's proprietor, MonkuWino, made the decision yesterday to stop posting new entries and instead allow the site to become a wasteland on the web. "Posting reviews of wine got to be boring," said MonkuWino to reporters gathered at the press conference. "The real purpose of this site was to have some fun by writing flippant entries, like harassing Domaine547's poor Budo Kun, but the idea well ran dry a long time ago. I just don't have enough time to think of anything fresh." Why not just continue to post wine reviews? "I'm still drinking the wine and enjoying pretty much everything I've purchased so far," added Monkuwino. "In that respect I've been fortunate. But like I said, just posting up wine reviews and having to take pictures of the bottles and find a good YouTube video to complement the wine - well, that just takes too much time for a lazy fool like me." When asked if he would reconsider if the government made an equity investment in his web site, or threw part of the $700 billion bailout money away by using it for him instead of wasting it on banks and other financial disasters, Monkuwino said that still would make no difference. "It's like in the movie Forrest Gump, when he decides to go running and he runs from one end of America to the other and points inbetween, and one day stops right in the middle of the highway because he doesn't feel like running anymore. That's me. And that's all I've got to say about that. I wanted to blog to be like a box of chocolates but it got to be too predictable." 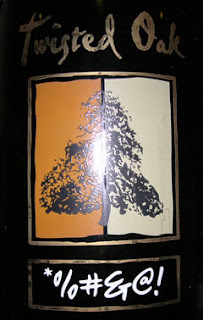 2005 Jean-Louis Tribouley Vin de Pays des Côtes Catalanes Orchis: Very, very good bottle of wine. First impression was of tons of earth and minerals, with concentrated fruit underneath. It had a smoky, cedar and soy character as well. Complex, lots of flavor and a really long aftertaste of smoky fruit. For $16.99 from Garagiste, this is an extremely good value. 2006 Eric Kent Wine Cellars Chardonnay Russian River Valley: Based on the Cellar Tracker reviews I read, I was expecting some overblown oaky monster of a wine. I have had only the first 1/4 of the bottle but so far this is a very good wine. It's got buttery oak but that is well integrated with the complex fruit flavors. By complex I mean there was a melange of different fruits on the palate, like pear, peach, apple and citrus, which along with the buttery character and good acidity made for a great glass of wine. It's kind of pricey at $29.75 per bottle from the winery, but you could do much, much worse at that price. At least this one makes you feel like you got your money's worth. I'm looking forward to the other three glasses to confirm those first impressions. Tablas Creek turns out some very fine wines, and here's another one. This one was $21.60, straight from the winery. Light yellow gold in color, the aromas were subdued. There was a bit of flowers and some spice but they were muted. The wine was subtle on the palate, as well. Apple peel, a taste reminiscent of those hard candy lemon balls dusted with powder (do you know what I'm talking about? ), minerals and ginger were the flavors I detected. It's a reflective, nicely balanced wine that would do well with food; one to roll around in your mouth and focus on savoring the various flavors as they emerge, rather than them jumping out and punching you. I liked it over all four nights so it gets a four-bottle rating. The inaugural wine under my new rating system is a good one - the 2005 vintage of the unpronounceable red blend from Twisted Oak. This one I purchased from WineQ last year and it set me back $27.99. There was a lot going on in the aromas and flavors - cedar, smoke, soy spice, pepper and abundant berries all wrapped together and getting along with each other, no less. It had a very long smoky berry aftertaste. 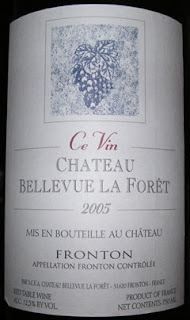 I thought this wine had excellent balance, plenty of complex character, and it was a joy to drink. I enjoyed it immensely over all four nights that I tried it and it gets a four-bottle rating from me (meaning that it got through all four nights, my normal time span for drinking a bottle of wine, without my tiring of it). This was a good one! Actually I'm just trying to post an entry so as to not get knocked further down in the search engines or lose my already sinking place on the highly subjective Alltop wine page. The wines I drink at home are consumed over the course of four evenings. I open the bottle, fill up three 187.5 ml bottles for subsequent nights, and then pour the remainder into a wine glass to enjoy that same night. As you might guess, some wines are better than others and depending on the wine, I have varying degrees of anticipation with respect to finishing off the remaining three 187.5 ml bottles. Some I am not that crazy about, and some I really look forward to trying again. Some I am happy or relieved after that fourth bottle is gone, and some I wish I was back on the first bottle instead of the last. My new rating system is going to be based on five bottles. Simply put, the bottle rating will tell you how many 187.5 ml bottles I consumed of the wine before I got tired of it or lost interest or really didn't feel like drinking it again the next night. A four-bottle rating means I enjoyed the wine enough to drink it all four nights but after that fourth night, it is time to move onto something else. That's pretty good, in my book. And a five-bottle rating means I regret not having more of the wine to drink. In my book that would be a darn good wine. That's the new rating system. Hey Rickie, we haven't seen you for such a long time, and we miss you here on Twitter, man! C'mon back and let's have some fun!! Thanks, Russ! I guess it has been quite a while since I've Twittered with the other Twitwits. I still get notices from Twitter telling me that so-and-so is now following me; most of the time I will check out their Twitter page and web page and see that some of them blog and Twitter in a foreign language and I have no idea what they are writing about. Anyway, the reason I don't Twit anymore is mainly from not having time. Also, I wound up following too many people and found that there were too many comments being made to keep up with. I'm not really an IM or Twitter or social networking kind of person anyway so I find myself forgetting to even log in to catch up with stuff. Well, that was very nice of Russ to think of me. Let me just say that I am still very much enjoying my wine and look forward to many more glasses in the future. 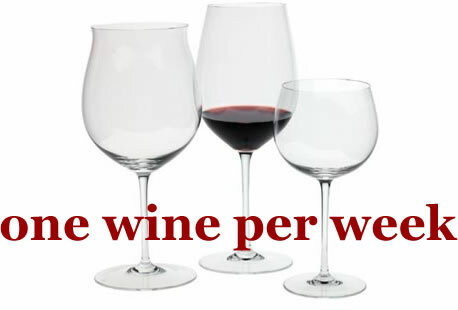 Also, in response to my own feeling that I am oversubscribed, this week I canceled all of my wine club memberships, subscriptions, etc., because it was heading towards the problem of having too many wines for practical consumption, i.e., no place to put everything. I only have a fairly small temperature-controlled area to keep the wines. I wish I had a cellar in the house or could afford larger wine storage alternatives but that isn't the case so I unfortunately and with much regret canceled everything. It was also done from a financial standpoint as well, as I began to get carried away by spending too much money. Now, after having Twisted Oak's Twisted Few among the memberships I canceled, last night I twisted off the cork on a bottle of their 2005 *%#&@! (the red one) and thought, should I have canceled all these? This was one awfully good bottle of wine! It will be the next one for review in a couple of days. Sigh.. I only drank 1/4 of the bottle so there's three more evenings left of it (mmm, good) but just the thought of canceling all of these fine wineries and the wines they produce.. oh, well. One day I shall return! And with that, have a very fine weekend, y'all! Today's review is of an unusual wine, one that is 100% from the Negrette grape. I'd never heard of it until I received an offer for the wine from Garagiste. I forked over $11.84 to give it a try based on the prose in the e-mail. Negrette is a varietal originally planted just to the side of Toulouse by settlers from Cyprus during the Crusades. It is one of the oldest varietals in the world and it has light to medium bodied style and soaring perfume of spice and violets. I didn't think the aromas were "soaring" but I did detect some violet. What was more prevalent than that were aromas of menthol, earth, and what to me seemed like a mix of spearmint chewing gum and raspberry. A medicinal aspect was also present. On the palate the wine was even more unusual. Lots of earth, and what I can only describe as very dry raspberry fruit buried under a layer of sand and gravel. It was like the fruit had no fruitiness or sweetness to it, just the bare fruit. Odd. I let the wine sit in the glass a long time after which more fruit emerged but it never did get past that really dry stage. It was worth trying once just because it was so different, but once was enough for me. The wine was not flawed and perhaps it needs more time because it did improve with air, but I just didn't care for that style. The part of my tongue that senses sweetness didn't detect anything but a plastic-like feel. I kept trying to taste more than what was there.